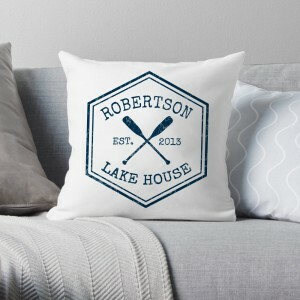 There is no better way to personalize your happy place than with this lake house throw pillow. 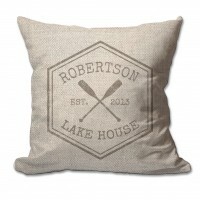 Super soft poly micro-suede material is off-white and printed with a design that features your lake house name, crossed oars, the words lake house and an est year in a distressed navy look. 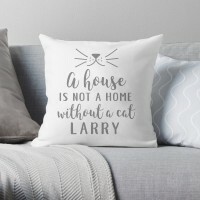 Generously sized at 17" x 17" and made from 100% poly micro-suede, the design is completely embedded into the fabric so you cannot feel the image with your hand, leaving the pillow both super soft and stylish! 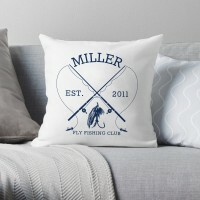 Great gift for a housewarming, anniversary, wedding or birthday! 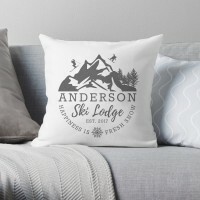 There is no better way to personalize your happy place than with this ski lodge throw pillow. Super ..
Do you have a special feline in your life that you consider a part of the family? There is no better.. This charming textured linen throw pillow will be cherished by your favorite couple for years to com..